I was at the range today, trying out my “hit it a long way” swing, which works most of the time. At the range. So when you go to the range, practice your “play” swing. The one you’re going to use when you can’t rake another ball over and maybe do better. That’s your best swing. Practice that one. 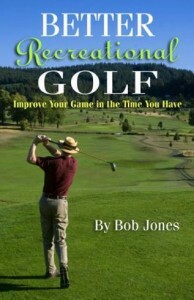 Golf swing practice should be, at its core, learning how to repeat your swing, and learning it so thoroughly that when you play you never have to think about what your swing is doing, but rather where the ball is going to go. You don’t learn how to do that by swinging over and over. You learn by breaking down your swing and building it back up, one part at a time. And repeating that endlessly. Let me go to music to demonstrate what I’m saying. When you learn a new piece, you first memorize it in little bits, a few measures at a time. You would start with the most difficult parts, because they need the most work. After all of the piece has been memorized, you learn how to play the little bits smoothly, and how to connect them. It’s a slow building-up process that leads to playing the piece all the way through. When the entire piece has been learned, you practice it, not by playing it all the way through over and over, even though you can, but by playing and connecting those little bits, just like you did when you were learning it. You build up larger and larger compilations of the little bits until you are playing the entire piece. You’re always working on the details, so none of them get forgotten. That is how you practice your golf swing. You should know what the little bits are that make you swing work. Practice each one, in isolation, to drill them into your unconscious mind. Then build up your swing, one bit at a time, until you are swinging from start to finish, hitting all the bits you were practicing. Then go do all that again. You most likely forgot to do X because you don’t practice X. You make only full swings and hope that part gets right somehow. But it never will get right until you practice that part alone. And all the other parts as well, each one by itself. At the range, build up your swing, bit by bit, before every ball gets hit. After you hit that ball, repeat the building-up process again from the very start. This method seems slow because you will make fewer full swings. It actually accelerates learning. Not to mention, the full swings you do make will be linked up and just like you want them to be. Once you have developed reasonable skills, your practice should be built around lowering your score. By that I mean practice particular shots that will help you get the ball around the course efficiently and into the hole quickly. You might think that the point of practice is to build skills that accomplish those two things. But I mean the opposite. Practice accomplishing those things then take what you practiced onto the course and use it. I came up with this thought a few days ago when my approach into a green came up about 4 feet short and I had about a 35-foot chip. The ball was resting slightly on upslope. The more I looked at the shot the more I liked it because I realized I practice that shot all the time. There is no mystery in it. All I have to do is hit the ball. So I did and it ended up 15 inches from the hole, like I knew it would. Another shot like this is 63-yard pitch. There’s a flag that distance from the mats at my range, so I warm up by hitting balls at it. Over the years I have become very good at hitting a golf ball 63 yards. I know that if I have a pitch on the course between 60 and 65 yards the ball will end up one-putt close, not because I have a great pitching game, but because I hit this particular pitch all the time and it has become second nature to hit a ball 63 yards. Golf has almost an infinite variety of shots that can be hit. You can’t practice them all. I’m suggesting that you pick a few and practice them to the extent that you know every time you step up to hit one of them something good is going to happen. – 3-wood off the tee—to be used all the time or when your driver is being a bad boy. – Advancement shot from the fairway, say of 175 yards. – A pitch from a given distance. Like I said above, I have 63 yards pretty well figured out. But what if it’s 80 yards? I’ll just take two clubs more and put the same stroke on the ball. Et voilà. Roughly 80 yards. – A chip to a certain distance. Same comments as for the pitch. – A 30-foot putt. Same comments again. – A 3-foot putt. Gotta sink those every time. You can make up your own list. The point is to get very, very good at the shots on your list. If you have them down can’t-miss cold they will be all you need to play well. You will never have a bad day. Again. There isn’t enough time to practice being good at everything. If you try, you end up being good at nothing. Practice shots you know you’re going to use. When you play, put yourself in a position to hit those shots as often as you can. That’s how to shoot low scores. Golf is hard. Golf under pressure is harder. Instructors, even highly paid golf psychologists, tell us we have to put pressure on ourselves during practice to learn how to play with pressure. Here’s an example you come across all the time. When you’re on the practice green, make 10 three-foot putts in a row. Miss, and you start over. Feel the pressure build after you have made 9 in a row because you can’t stop the drill until you make that 10th putt. Except there are two problems with this drill. One is that after you make a three-foot putt on the course, your next shot is likely to be with your drive from the next tee. The second problem is that this drill doesn’t teach you how to play under pressure. It teaches you how to create pressure by letting your past or your future define your present. That’s no way to live, and that’s no way to play good golf. How about instead we learn how to control our mind so that pressure, which is entirely of own creation, never gets created? 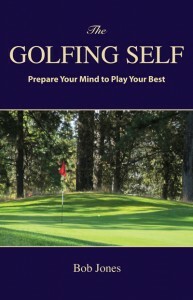 How about we spend as much time developing our mind as we do developing our golf skills? How would you do that? Simple. Hit practice shots just like you would on the course. Hit this shot, then move on. Learn to play each stroke isolated from ones that came before, and leave the ones to come for when you get to them. Say you’re on the practice green. Drop a ball 30 feet from the hole and hit an approach putt. Go up putt out, then do something else. Drop a ball four yards off the green and get the ball in the hole. Then do something else. Do this over and over—in realistic shot sequences, and when a sequence is over, go through a different one. If you’re on the practice tee, hit a club once, put it away, and hit a different club, preferably at some remove, like fairway wood, 9-iron, 5-iron, and so on. When you practice like this, on the tee or on the green, each shot or each swing being different from the one before, and only giving yourself one chance to get it right, that’s golf you’re practicing. All the while you will be developing the mental skill of playing the shot at hand, without worrying about how it will come out or whether you can hit it at all. Now I’m not saying you should practice like this all the time. There’s nothing wrong with hitting 10 three-foot putts in a row to learn how to hit three-foot putts. That comes under the heading of skill-building, and you have to do a lot of that to get good. But keep it at hitting one putt ten times. Golf is not the sum of your skills. It’s the application of those skills. If you can learn how to play with a steady mind, I would say you can play four strokes better than your skills would otherwise suggest, because that steady mind lets your best performance emerge. I’ve been doing this drill lately to build an identical swing with each club. It pays off throughout the bag, but especially when you get to the driver. It also takes a lot of discipline. You’re going to go through your bag, from the most-lofted club to the least lofted (probably your driver), and hit a good shot with each club, using the same swing with each club. You only get to hit one shot with each club. Thirteen swings. No do-overs. By the same swing I mean the same movement, same rhythm, same tempo. THE SAME. This is the whole point of the drill. The only thing that will change is your posture as the club shafts get longer. This is a very difficult drill. First of all, you want to hit 13 good shots and you only get one chance with each club. Hitting 13 good shots in a row isn’t easy. Second, as the clubs get longer, the temptation to swing harder or to get the clubhead on the ball in a different way is great. But you can’t do that. Each swing has to be the same. The reason you want to have the same swing for every club is that one swing is easier to learn, easier to rely on, and makes golf easier to play, than two or three swings do. You will also learn to trust the design of the longer clubs to get the distance you want from them. As clubs get longer, they have a lengthier shaft and less loft. That alone is enough to send the ball father and farther. You don’t have to make extra effort. Do this drill (one time) at the driving range. Doing this drill in your pre-round warm-up might be a good idea, too. The difference between golf and most other stick-and-ball sports is the ground. In baseball your contact can be off by an inch but that only makes the difference between a single and a home run. If you’re playing tennis you can be off by two inches still get the ball back over the net. But in golf if you’re a half inch off, even a quarter of an inch off, you can hit the ground before you hit the ball your shot is ruined. The ground is what makes golf hard. But there is ground and there is ground. What kind of ground do you want to hit the ball off of when you practice? There are two choices at the driving range, grass tees or mats. Both have advantages, both have disadvantages, and both have their advocates and detractors. Grass is the real thing. That’s what you’re going to be hitting the ball off of when you play, so it does make sense to practice hitting off the same surface. Not to mention, you don’t always have a perfect lie in the fairway, so hitting off grass gives you the opportunity to learn how to hit off less than ideal lies. The disadvantage of grass is that the tees are normally so chewed up that it’s difficult to find an ideal lie and you certainly want one most of the time. A useful exercise on the grass tee is to take ten balls, give them a toss, had hit them off whatever lie they have come to rest. But you don’t want to make that standard practice. Mats, on the other hand, always give you an ideal lie. I’ll admit if the mat is old and worn you only get to practice hitting off hard pan, but most ranges keep their mats in good repair and replace them when they no longer useful. The main beef about mats is that you can hit fat and get away with it. And that’s true. You can hit inch behind the wall and still get a decent shot out of it. But that just means you have to be honest with yourself. You know what fat contact feels like. If you feel it, it’s up to you to admit to yourself that was not a serviceable swing. But when you hit the ball just right, when you get that solid, ball first ground second contact that pinches the ball between the ground in the club face, you know it in a way you never would on the grass tees. That much better feedback for the good shot is a huge argument in favor of hitting off mats. There is another advantage of mats that you might not think of depending on where you live. I was responding on a golf forum once to a person who said he hits off grass all the time and wondered why anyone would ever hit off a mat. I replied that if you hit off the grass during winter in the rainy Pacific Northwest, after about three shots all you would have would be soggy mess. He was from Southern California and hadn’t thought of that. A minor argument but one that nonetheless applies to golfers who don’t buy new clubs every few years is the grit the golf club digs up when hitting off grass will eventually wear down the grooves on the clubface. That’s why professionals get new wedges about three times a year. Their wedges get used so often the clubface just wears out. But for me, it comes down to this: good contact is everything in golf, and mats are the best teacher. I would assume without too much chance of error that every golfer wants to improve. A perpetual 104 wants to become 98. Books have been written, not on how to turn 95 into 91, but 93 into 89, though there is not much difference between the two differences. At the other end, championship golfers are always looking for a little something that will make even more championships easier to win. So to the range we go, trying this tip or that hunch in search of the perfect shot, or at least a shot that is closer to perfection than the shots we’re currently most proud of. And therein lies the mistake. We improved to our present point incrementally, never in great leaps. So, we should not be looking for improvement in great leaps. Rather, the best use of our practice is learning how to hit good shots within our present capability, one after another. We don’t need to hit perfect shots. Golf, thy name is consistency, and hitting the same good shot time after time is the way to play it. This is what we should be schooling ourselves to do at the range. I should clarify what I mean by “a good shot.” I mean one in which you make clean ball-first, ground second contact and the ball goes straight to where you were aiming it. The distance it travels is not important. Occasionally the perfect shot does pop out, and we stop, trying to figure out how that happened so we can do that again. So now, instead of enjoying that perfect shot and getting back to business, we begin chasing it. You might have a good idea of how you hit your string of good shots that preceded this one but you really have no idea about how the great one happened. Trying to figure it out is taking a detour down a dead-end road. As you keep hitting the string of good shots that you are capable of and understand how to hit them, really good ones will pop out. Let them. Just keep doing what you’re doing. In making the gradual transition from one level of play to another, the really good ones will pop out more often. But you cannot force them or chase them. Let them emerge in their own time. The best way to practice hitting one good shot after another is to hit them all with the same club, an easy club that you can control, such as your 9-iron. Use a different club if you like, but not if you hit only mostly good shots with it. You’re aiming for ALL good shots. Besides, if you can’t hit a 9-iron consistently well, why would you want to hit an 8-iron at all (or a driver, it should go without saying)? Hint: The less hard you try to hit a good shot, the easier it to hit one. Whenever I go to the range, which is about once every other week, there’s this guy who is always there. Always. With a big pile of balls in front of him. I’m not sure what he’s up to. Maybe he just likes to hit golf balls. If that’s his retirement hobby (and he’s gotta be retired to be there at 10 every morning), fine with me. But if he’s trying to improve, I don’t know how being out there all the time and hitting so many balls is going to do it. I’ve seen what he can do. He hits the ball really well, about as well as he ever will, and as well as a recreational golfer needs to. He knows how to swing the club. All he really needs is a reminder every so often so he doesn’t forget or start drifting. In this month’s Golf Digest there is an article “by” Dustin Johnson on how he practices. He says he hits mostly wedge shots, then chips and putts. He’ll hit a few shots with the longer clubs, then he goes to play. He’s keeping his swing in tune, but putting time in on what goes away fast if you let it slide–the short game. Pounding balls is not part of his practice plan. I read once that not many pros thought all the drivers Vijay Singh used to hit did him any good at all. After a few he wasn’t adding anything. I would say to you, if you know how your swing works*, get a small bucket of about 30 balls, hit half of them with full swings, and the rest with your wedges to different targets. Another key point Johnson made is one my pro made to me a few years ago. You need a new perspective every so often. Staying in the same place at the range and hitting to the same target doesn’t prepare you for the course, where every shot has a different look. Either hit to different targets, or hit to the same target but move to a new spot some distance away so the look of the shot is new. That gives you the sense of playing that should be part of your practice. In 2014 I published my Six Fundamentals. They’re my swing keys, and I hit only enough balls to make sure I’m still doing them so I get good results. Butch Harmon charges three million dollars an hour for the same advice you get here for free. *Write down your own set of fundamentals, or swing keys, or whatever you want to call them, that your swing depends on so you can always refer to them when things go wrong. 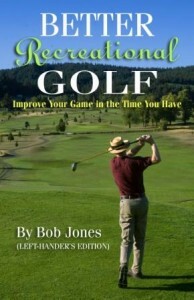 Whenever you read a golf instruction book, or watch a video on YouTube, that instruction is fixed. Everyone reads, sees, and hears the same thing. But what each person needs to do to make that instruction work will be different. That’s because golf is personal. By “personal”, I mean everyone is different in their size, strength, flexibility, conformation, and conception of athletic movement. This means everyone has to do something a little bit different to install the same bit of instruction into their swing. I can only use myself for an example to explain what I mean. When you take the club away, the face should rotate open to stay square to the swing path. When I bring the club back, my natural preference is for my right forearm to stay oriented toward the ball somewhat, and not rotate clockwise. I don’t try to do that, it’s just me. …I begin my swing with a gentle push by the left hand. Now my left arm dominates, the right arm turns like it supposed to, and the clubface stays square. Or when I pitch. This one absolutely drives me nuts. From out of nowhere, SHANK! It’s just a short stroke. How can you hit a hosel rocket? Well, getting back to the right hand. If I try to control the shot with my right hand, I discovered the club pops outside a bit on takeaway. Now the swing plane is forward of its position at address. The shank is baked in and there’s nothing I can do about it. So again, I begin the takeaway with a gentle push by the left hand, which keeps the club on plane. Two problems, same solution, because of the same tendency. Here’s a different one. I will see the hole to the left of where is really is when I stand up to a short putt. Needless to say, I miss to the left more than to the right. I pointed this out during a playing lesson, and the pro noticed right away that I wasn’t standing square to the line of the putt. My feet were in place, but my hips were turned a tiny bit to the right. This had me looking around a corner to find the hole. I don’t align my hips deliberately that way, that’s just what happens when I take my stance. So when I get into my putting stance now I always kink my hips the slightest bit counter-clockwise to get square. These are three examples, and I could give you more if I thought about it, but you get the point. I’m doing everything right, but by just being me I introduce tiny errors that put me off by just enough to make the difference between a good shot and a not so good one. It will do you some good to investigate the mistakes you’re making to find out if they are errors in technique, or errors that have only your name on them. If it’s truly the second, you can keep doing what you’re doing and build in another move to compensate, or, much easier, build in a prevention so you’re right from start to finish. Really, I think you’re much closer to being a better golfer than you are now if you can only attend to these little details. When you figure how precise the impact geometry has to be to hit a good shot, it only takes a little detail to throw it all off. Correct the little details and you might start playing a different kind of golf. About a month ago, I posted some suggestions for your winter practice. I was following that plan at the time, but you know how my mind wanders, so I thought I would let you know what is going right now. It’s hard to practice approach putting when it’s raining so much and the practice greens are soaked, so most of my putting practice goes on in my back room on a very short-pile carpet–perfect for the task. I am firmly committed to the two-putter plan. That has me practicing up to ten-foot putts with my face-balanced putter, at least nightly, and whenever I’m home with nothing important to do (which is all the time when I’m home). When I go to the the range, I bring my sand wedge and my pitching wedge. I pick out a target on the ground and try to drop a ball right on top of it. I don’t pitch to an area. I pitch to a spot. Most of the time it’s a ball lying out there somewhere. I have been doing this for years at the range, and have developed a sense over that time of what a distance feels like and what I have to do to hit the ball there, just by looking at it. Sometimes I get the ball so close it’s scary. Not bragging here. If you practice something often enough you get good at it. As far as the swing goes, I am deep into a new (for me) mental approach to it. I have written about Gabrielle Wulf’s work on the benefit of external focus (in golf, the club) rather than internal focus (the golfer) in learning, improving, and performing. Now let’s combine that with the Ernest Jones method of “swing the clubhead.” To me, that is an early expression of external focus. By swinging the clubhead, the body will automatically do the right thing. Well, it’s a bit more complicated than that, but it is on the right track. I swing a Titleist 20.5° fairway wood (975J) in my back room. I take the club back slowly with a gentle push by the left hand. Slow is important because I want to feel the clubhead throughout the swing. If the start is too fast, that feel will not emerge. The backswing is nothing more than feeling the clubhead move back and up. The forward swing is the same. I feel the clubhead move down, around, and through. My mind is on nothing else than the clubhead moving. I mentally follow its movement back and forward again. I really have no concept of what my body is doing, because my mind is on something else, so getting stuck on technique is out the window. I can’t think about hitting the ball, hitting it a long way, hoping I will hit a good shot, or any other irrelevant and destructive thought. It’s just, follow the clubhead. The results I’m getting are very good. I’m hitting good shots easily. If you want to try this, I suggest you begin with a sand wedge, because its weight makes the clubhead easy to feel throughout the swing. There is no need to bend way over when you swing it. Stand up in your driver stance and pretend your sand wedge is a short driver. I have been through a lot with my health in the past six years. I am unable to play golf the way I used to, but that doesn’t mean I can no longer play good golf. It means I have to find a different way. I have growing confidence that this is the way.